Nowadays, the Customer Experience is a key factor and the most important differentiator than the price and product that is sold. Well, it’s quite true. As the world is witnessing many emerging technologies, the customer experience is gaining importance equally. Even, the number of customers is also increasing and so their expectations. Once, the world was hit by “mobile-driven” technology and brought many new changes. However, the time has passed by, and now, the new technologies have come into being. Multiple researches says- CX is directly associated with your company revenue. Better CX means higher revenue. AI is playing a major role in intelligent customer experience- with machine learning, you can measure the digital experience score of a customer. The world’s giant tech conversational platforms are now turning into AI-powered interfaces, and enhancing customer experience to a great extent. The integration of Google cloud, powered by AI, with contact center solutions is one of the latest examples that are offering innovative experience to the users. Google Cloud and contact center integration is the paradigm in service industry, where agents and customer both are getting benefited. In 2018, Google released this feasible solution that enables companies, which have limited machine learning skill, to deploy the Artificial Intelligence (AI) into their contact centers. Google cloud is the leader in artificial intelligence (AI) technologies that use AI to improve people’s lives. Contact center providers are using AI to deliver the best customer experiences across the entire base of customers. AI-Powered Virtual Agent: Virtual Agent allows users to go beyond the IVR (Interactive Voice Response) systems. The Virtual Agent makes the best use of NLP (Natural Language Processing) to understand the customers’ sentiments so that it can give responses what they want. This component works to achieve the highest level of automation without compromising the accuracy factor. Additionally, it fetches and uses the company’s and customers’ data to match the expectation level of the customers. AI-Powered Agent Assist: AI-powered Agent Assist guides the agents with correct answers during the interaction with customer. And, the entire action is executed on basis of the analysis of previous interactions in real-time. Plus, in case, if Virtual Agent is not present, then it will transfer the call to the live agent (human representative). This will make the agent more knowledgeable and let him/her resolve the issues in more proficient manner. AI-Powered Analytics: Last but not the least, Analytics makes use of the enterprise data & knowledge to educate the Virtual Agent and the Agent Assist to empower them to serve customers better. Moreover, this AI-driven component works on the larger set, such as- identifying trends, and, finding out the reason why customers are contacting the company or the coach agents. In a few words, the Analytics works to enhance the overall agent’s performance. Customer expectations are never-ending. Whether it’s all about call center solutions or the company’s services itself, the customers always crave for the best. But, with time, the customers’ expectations are increasing as well. To cope up with all challenges, Google cloud solutions are emerged that are AI-driven. 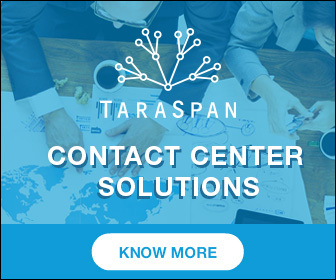 And, these solutions are combined with contact center to help customers and deliver them the best services. 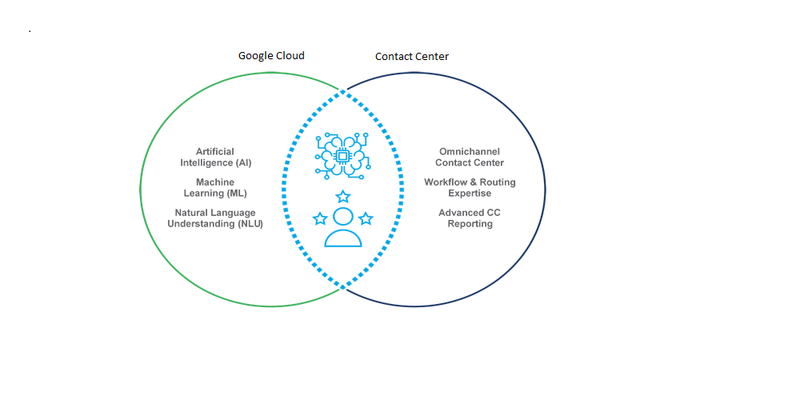 Google Cloud Contact Center AI comprises Enterprise Edition of Dialogflow that offers the conversational interface and chatbots for websites, IoT devices, and other mobile platforms. Additionally, Google has added some enhancements to it, and now, it can build AI-powered Virtual Agents for different contact centers. And, using machine learning and NLP (Natural Language Processing), enterprises are now able to build various conversational interfaces, on which, the Virtual Agents can schedule meetings or appointments, can give answers to queries, or can perform basic tasks. The process doesn’t end here. This system keeps learning and enhancing with time. Hence, this constant improvement will directly or indirectly improve the Customer Experience (CX). Have you ever imagined online shopping in terms of Artificial Intelligence? Time to visualize the concept of online shopping integrating AI into it! Let’s take a buzzing example. All of you have chosen eBay for shopping once or more. So, a customer has bought a pair of running shoes of size 6 of Wiper Marker brand from eBay. However, unfortunately, the size could not be as per as her foot size. So, she wanted to return that pair of shoes. For this, she made a call and the automated agent or Virtual Agent received the call at the other end. She, then, told the Virtual Agent to return the product, as the size was not up-to-the-mark. The Virtual Agent then initiated the process of returning with an email that included the details of returning the shoes. Now, she wanted to purchase a new pair of shoes. The Virtual Agent interpreted her intent and asked her to connect her call with the eBay Fashion Expert. Subsequently, the Virtual Agent connected the call with the live agent or the human representative (the eBay Fashion Expert), who helped her buy the right pair of shoes. 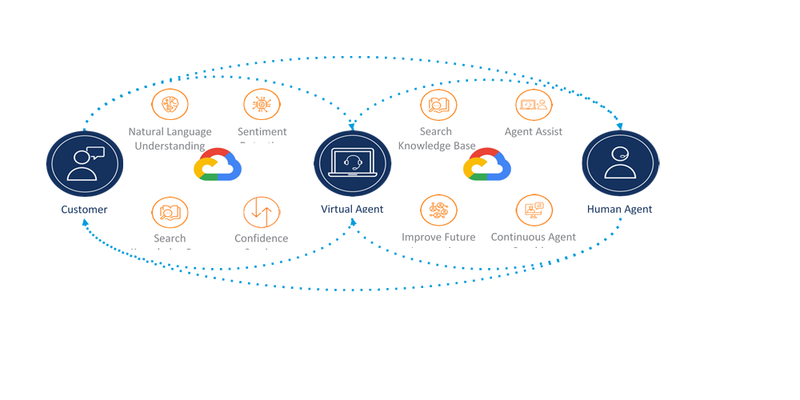 Google Cloud AI has recognized her intent and collaborated with the contact center to transfer the call to the live agent. Then, the contact center has bridged the gap between the customer and the human representative. Hence, the call was connected with the live agent, keeping all previous conversations of ordering & returning the product in loop. While, they were interacting with each other, Agent Assist has interpreted and gave some suggestions on the basis of conversation. In this way, the Agent Assist has found the relevant content and helped the live agent in real time. Proceeding, the live agent suggested the tennis shoes and then asked about the court. “The court will be hard.”, replied the customer. After that, the agent asked the brand, then the customer went with “Pamarca”. At this moment, Agent Assist identified all her gestures, found the relevant content, and made it available to the human representative. Last but not the least, the live agent presented the suggestion (product with all-required details) to the customer with two options- “Send text” or “Send email”. Eventually, the customer told to send the text, and the live agent followed her instruction. In the nutshell, Google Cloud AI and the contact center make the communication seamless that will enhance the matching efficiency and increase the success rate of customers, revisiting the website and ordering the product once again. 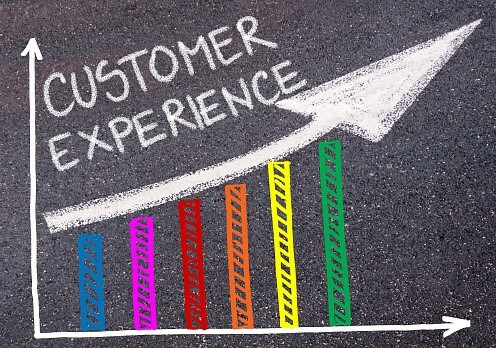 Customer Experience (CX) is the key to be ahead in the competition in the present era. Listening to your customers and giving responses what they want is the principle that helps you survive nowadays. And, the integration of Google Cloud AI and the Contact Center is the best way to deliver seamless customer interaction that will lead to escalated customer experience. Help your customers find and get what they love, and you will be ahead in the competition! Arpita Saxena is a Content Writer at TaraSpan. She likes to explore and read about the latest technologies to provide the knowledge to the audience and educate them with correct insight.